MUNICH/BRUSSELS (Reuters) - U.S. Vice President Mike Pence accused Iran of Nazi-like anti-Semitism on Friday, maintaining his harsh rhetoric against Tehran just a day he attacked European powers for trying to undermine U.S. sanctions on the Islamic Republic. 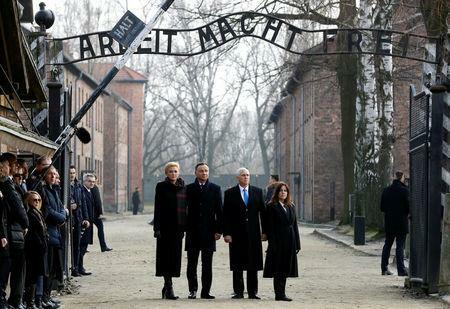 After visiting the Auschwitz concentration camp in Poland, Pence said the Nazi death camp had made him more determined to confront Tehran, saying it was "breathing out murderous threats, with the same vile anti-Semitic hatred that animated the Nazis in Europe." Pence, who said he was deeply moved by his Auschwitz visit, cited Iran's stated desire to destroy Israel as justification for singling out the country, rather than focusing on anti-Semitism across the Middle East. Iranian Brigadier General Hossein Salami, deputy head of the elite Islamic Revolutionary Guard Corps, said in January Iran's strategy was to wipe "the Zionist regime" (Israel) off the political map, Iran's state TV reported. "For me it simply strengthens my resolve ... to stand strong against Iran," Pence told reporters on his Air Force Two plane before arriving in Munich. The United States is seeking to isolate Tehran and reimposed economic sanctions last year after pulling out of the landmark 2015 Iran accord with world powers that prevent Iran from developing a nuclear weapon. However, the tougher stance comes as the European Union is trying to keep the nuclear deal alive and has developed a mechanism to open a channel to continue to trade with Iran, bringing sharp criticism of Brussels from Pence on Thursday. U.S. Secretary of State Mike Pompeo and the EU's top diplomat discussed global conflicts but largely avoided the issue of Iran on Friday. Pompeo's meeting with Federica Mogherini, the European Union's foreign policy chief, was scheduled before Pence's rebuke of European powers, during a Middle East peace conference in Warsaw on Thursday. Mogherini missed the Warsaw conference, citing a scheduling conflict at NATO. Mogherini shook off a question seeking her reaction to Pence's Thursday speech. State Department spokesman Robert Palladino said the vice president's remarks were not raised during the hour-long meeting, which he said was friendly and constructive. They also did not talk about the Iran nuclear deal, although they did discuss Iran's "destabilizing activities and the need to counter them," he said. A spokeswoman for Mogherini said the talks with Pompeo had focused on Venezuela, Syria, Afghanistan, the Korean peninsula, Ukraine and the Western Balkans. Pence's unusually tough words on Thursday for allies Germany, France and Britain reflect Washington's strategy of isolating Iran, and are likely to further strain transatlantic relations. In a speech on Friday evening in Munich with European and U.S. officials, lawmakers and diplomats, Pence said: “I bring you greetings from the 45th president of the United States, President Donald Trump.” He paused for applause. The room was silent for a very long moment. Under the 2015 nuclear deal, Tehran accepted curbs on its nuclear program in return for the lifting of sanctions. On Thursday, speaking at NATO before Pence's comments, Mogherini said upholding the deal was vital to European security because it prevented Tehran from developing a nuclear weapon. European countries say they share U.S. concerns about Iran's involvement in wars in Yemen and Syria but that withdrawing from the nuclear deal was a mistake. They have promised to try to salvage the deal as long as Iran continues to abide by it. In practice, European companies have accepted new U.S. sanctions on Iran and abandoned plans to invest there. France, Germany and Britain have agreed on a new channel for non-dollar trade with Iran to avert U.S. sanctions. That will likely take months to open, however, and is expected to be used only for smaller trade such as humanitarian products or food. Mogherini and German Foreign Minister Heiko Maas on Friday defended the nuclear accord with Iran at the Munich Security Conference despite Washington's repeated attacks against the bloc for keeping to the deal. France's Foreign Minister questioned Washington's policy in northeastern Syria saying it contradicted its tough stance on Tehran because a U.S. withdrawal would only reinforce Iran. "We hate what Iran is doing in Syria. We hate what Hezbollah is doing in Lebanon. We hate what Iran is doing with the Houthis in Yemen and militias elsewhere. We hate what they have been doing in Europe and we're extremely preoccupied with its ballistic missile program," said a European official. "We're very lucid and extremely vigilant on all that, but Iran has kept its side of the nuclear deal and isn't building a nuclear weapon and that is vital to all our security interests."